Camping for some brings feelings of adventure. Mixed with spending time with friends and cooking on the camp fire, it can be some of your fondest memories you’ll have in Bali. 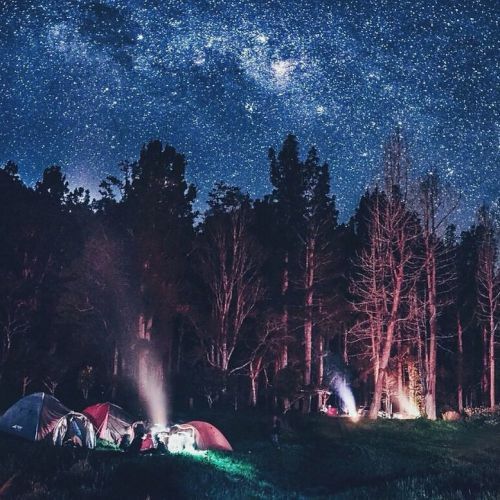 Camping, at its soul is to appreciate nature at its most basic level. Luckily, Bali and Indonesia alike, have some really loose camping laws and you can put your tent up pretty much anywhere without too much hassle. Just erect it away from the major villages and roads and no one will come to bother you. Of course, some camp spots are better than others so in this post we’ll show you the top places in Bali to camp. Nyang Nyang is a favourite place for people looking to get away from the crowds and enjoy the tranquility. It’s a well known fact that not many people venture to Nyang Nyang as the entrance requires a 20 minute walk down via the cliff side trail. With this walk in as a deterrent, Nyang Nyang makes the perfect place to camp and you’ll find that you have the whole beach to yourself. There is plenty of wood around so you can make a great camp fire and there is a huge field back from the beach. When the tide is high it’s a good idea to camp away from the beach as the water covers almost all the sand and you will get wet. You will need to bring all your supplies as this beach is quite remote and there is no water or food for sale. To get to Nyang Nyang click here for directions. This secret, little known spot is a gem in it’s own right and if you want a cliff top camping experience then this is the place for you. It’s also one of the most beautiful places to watch the sunset, so with these 2 things combined it makes a great off the beaten trail experience. As darkness falls you can watch the planes fly in from over the ocean and there is plenty of wood about to make a fire of just about any size. Of all the camping places in Bali this is one of the most special because of it’s undiscovered nature and being so close to the major tourist areas. For directions to the camp spot click here. Gunung Agung is the most famous volcano on the whole island and has 2 camp spots, both on opposite sides of the mountain. If you are coming from Pura Pasar Agung or Besakih, be warned that the camp spot may not be quiet due to people walking past in the night on their way to the summit. The camping here is superb, with arguably the best views of anywhere on the island. It can get cold so a good mattress and sleeping bag are in order. Also prepare a good jacket and if you are strong then it’s a good idea to carry some firewood to make a fire. This can be the difference between an awesome trip and a miserable cold one. The camp spots are located just below the tree lines. If you take Pasar Agung or Besakih route just keep climbing until you find a suitable spot. There are a few flat spots so just pick one that you think is best. If you’re coming from Kubu the camping spot is located at around 1700 m above sea level on the north side of the mountain. You must bring all water and supplies as there is nothing up here. This is a truly adventurous undertaking as hardly any people camp on the routes. Want to climb Gunung Agung? Bukit Asah in Karangasem is cliff side camping at it’s finest. One of the premier camping spots in Bali and also one of the easiest to access as the road goes right up to the site. From here you’ll have amazing views over to Nusa Penida and the small islands out at sea. From the picture below you can see why this is one of Bali’s best camp spots. Firewood can be found at the campsite and food and drinks are just down the road in the village. The campsite is green after the rains but during the dry season it’s just dead straw and dirt but none the less a great place to camp. Directions to the campsite can be found here. Desa Pinggan is located just across from the famous Gunung Batur and has some of the most stunning on the island. Arguably the views from here are as good, if not better than from Batur. The campsite is set upon a nice grassy area and with amazing views to Batur, Agung, Abang and Rinjani, it’s one of the only places on the island where you can see all theses volcanoes. There is a bit of a walk to get to the camping but just ask the locals and they’ll point you in the right direction. The sunrise from here is one not to be missed so make sure you set your alarm early and you’ll be treated to an amazing show. The small village close by has food and other things that you may need. Location of Pinggan Village can be found here. The campsite on Bayan Lake is located to south side and away from the busy and noisy Bedugal. The camp ground has stunning early morning views over to the bukit’s surrounding the lake. On a cloudless and moonless night the stars here are really clear and it’s one of the best places in Bali to see the stars because of the lack of light pollution. Be warned that the weather here can get cold. Bedugal has long been known as one of the coldest places in Bali and with that in mind it’s a good idea to pack a good sleeping bag. The camping area is very green as a lot of rain falls here and it’s a good idea to make a fire for warmth from the cold air. Bedugal has all the supplies you need so stock up before you go. Directions to the campsite can be found here. Nusa Penida is one of the hidden secrets of the Bali Regency. Located just an hours boat ride away, but still apart of Bali, Nusa Penida is a real escape from the craziness and a place where you can unwind and have the beaches all to yourself. One of the best beaches here is Atuh beach, near the village of Pejukutan. This beach is a small hamlet which looks out over the rocky bay. It is a great place to set up camp and make a fire on the beach. Supplies are available at the nearest village and there are tour operators who offer camping tours so you may have to share the beach. For directions to the beach click here. Gunung Batukaru is the 2nd highest volcano in Bali and has a great campsite in its own right. The campsite is on the very summit of the volcano and has amazing views. There are some trees that surround the site so there will be some protection from the wind at night. The summit height is over 2200m so be ready for some cold temperatures and be prepared. Bring all water with you and a good headlamp aswell. In the morning you’ll be treated to a beautiful sunrise and you’ll be able to see over to Agung and even to Raung in Java. For a comrehensive climbing guide on Batukaru click here. Gunung Abang is the 2nd highest volcano in Bali and one of the easiest to climb on the whole island. If you’re fast you can get to the summit in just 90 minutes. The summit is home to a holy temple but there is enough space up there for around 5 tents. The views are semi obstructed by the trees but you do have amazing views and even the climb up along the ridgeline is one that yo won’t forget in a hurry. For a comprehensive climbing guide check out Heinz Von Holzen’s trip report and if you would like to hear our interview with the 51 time Agung summiteer then click here. Hi love this. I am thinking of camping for a few weeks in bali next month. Do you think it is safe? Did people ever come across you comping? Also did you ever use camp sites are there any in bali?